From white plain shirts to white cheerleader's sneakers. It is all about the basics and incorporating them all together. Basics are my favorite. with just plain shirt you have so many outfits. You can just add so red jacket for a pop of color. Or maybe a leopard scarf to boost up the wild side. Its all about finding the right accessories to match things up. When you find so daring accessories or some crazy shoes. pair then up with basics. Then you'll realize that its not too much. 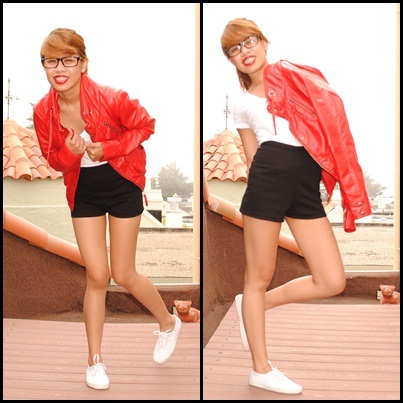 If I wore my red jacket with a red sequenced top with some leather pants, then I would look like a psycho. don't you think? Incorporate your killer heels with some plain jeans. You can never go wrong with basics. NEVER. Love these looks! That leopard scarf is so cute! oh I love the simple white shoes!!! I couldn't agree more with this post. The animal print scarf and red jacket are such AMAZING additions to a basic canvas! LOVE it! I like your blog, adding to watched. You are so beautiful, im in love with your hair color. Your blog is pretty amazing, glad i found it. By the way, that post on DIY sittie dress is a Must read for every blogger. Im following you for sure. You are right, basics are the key! Hi! !what a lovely blog, I like it! you look really great in all this outfit! You are so cute, your website is so lovely! I like to read what your wrote and posted, so much fun! I love your "philosophy"! It ensures that you're always wearing something interesting and stylish, without being over the top. Your so right, can't go wrong with a simple outfit. LOVE it! Your blog is amazing, I'm definitely following. Hope to hear from you soon! Loving all your outfits! 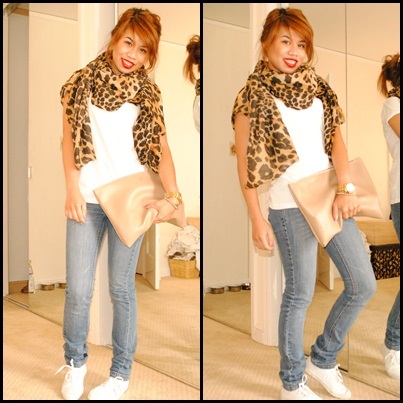 Great style and the leopard scarf is just too fierce girl. I love all of these looks! Simple, but so chic! I like the leo scarf! Looks nice. i do the same thing as you! i incorporate new, trendy styles with the basics so i can always switch up my outfits!! i love your blog! i just discovered it- i hope you can follow my blog, too!